Afon Rhaiadr Country House Guest AccommodationA warm welcome awaits at this Victorian Country Residence, set in 3 acres of beautiful gardens. Stylish decor, luxury bathrooms with rain showers & underfloor heating. Private spring water supply. River & waterfall in garden with lovely seating areas to relax, with the conservatory and lounge leading to the gardens being peaceful areas to unwind with a book or to meet up with friends and relatives. Guests can enjoy the comforts of Luxurious cotton bedding, towels and robes. All rooms have a courtesy tray, Freeview flat screen T.V with radio channel, Free Wifi, luxury bathrooms with rain showers & luxury toiletries. 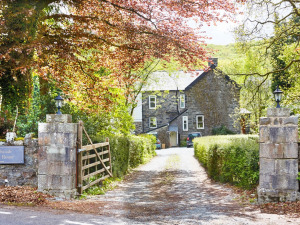 Afon Rhaiadr Country House sometimes limits bookings to 3 or more days. On the fringe of Dolgellau just off the A494 Dolgellau to Bala road. I don't understand why I have to explain myself - you requested ratings and I have given them.